You may have heard of using cold laser therapy for humans, but did you know that this alternative type of therapy can also be used on dogs and cats? There are many benefits that cold laser therapy can provide for your pet, and it can also help treat a variety of conditions. Cold laser therapy is a noninvasive procedure that involves penetrating a light into the fur and the surface of the skin in order to promote a process called photobiostimulation. This is a type of chemical reaction that helps to release endorphins, which in turn helps to relieve pain, improve blood circulation, and stimulate injured cells in order to promote faster healing. The number of treatments required largely depends upon the severity of the condition or injury, but most treatment sessions don't last longer than 10 minutes. Cold laser therapy is also used to enhance healing following surgery, as well as treat certain injuries involving the tendons, ligaments, and tissues. If you notice your dog or cat experiencing certain symptoms, such as sitting or lying in an abnormal position, not being able to get up or lie down, appearing restless, or having a lack of appetite, these could be signs that your pet is experiencing pain. Our veterinarian can evaluate your dog or cat to see how cold laser therapy could be of benefit. For dogs or cats that receive cold laser therapy, they often experience many benefits of this type of treatment. A few of the primary benefits this therapy has to offer is that it is completely pain-free and doesn't require the use of anesthesia or drugs. Your dog or cat will be comfortable the entire time they are having the procedure. Since the laser wand that gets used can penetrate through the fur, there is no need to shave or clip your pet's fur. This treatment uses a low-powered laser that emits no heat. When you arrive, our staff will treat your pet is comfortable and relaxing surroundings. Our veterinarian will apply the cold laser directly to the surface of your pet’s skin or slightly above it, depending on the animal’s comfort level. Most animals are so comfortable they require no sedation or restraint. We are able to set the therapeutic laser for shallow or deep tissue penetration and for a variety of time periods, depending upon the diagnosis. The laser beam is made up of wavelengths with photons designed to penetrate tissue. Cells that are malfunctioning as the result of disease or injury absorb these photons, which are instrumental in increasing the energy source for cells. This helps boost your pet’s cellular function for quicker nutrient absorption, waste elimination, and the birth of new cells. 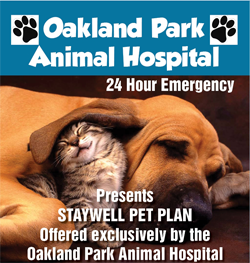 Each treatment at our Oakland Park Animal Hospital normally typically takes between 3 and 20 minutes, with no unwanted side effects. For problems like arthritis, relief might last for several weeks. Around 70 percent of the animals show signs of improvement from arthritic pain. 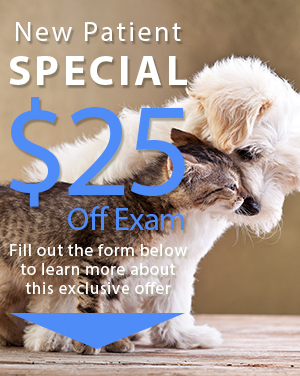 Is your pet ready to experience all the benefits cold laser therapy has to offer? Whether you live in Hollywood, Fort Lauderdale, or Oakland Park, contact our veterinarian today at 954-731-4228. One of the most exciting recent developments in veterinary medicine is the use of cold laser therapy for dogs and cats. Although this treatment has been used on human patients for 40 years, it is a fairly new way to help alleviate pain and promote healing in pets.